Take a closer look at your teacher experience by asking the right questions to better understand your education workplace from the teacher's perspective. Then learn to use those insights to craft your teacher journey step-by-step, creating a distinctive culture where teachers are engaged and thrive along the way. While working with a major U.S. school district, Gallup learned that the district's most engaged teachers have greater alignment with its aspired purpose, brand and culture than less engaged teachers. 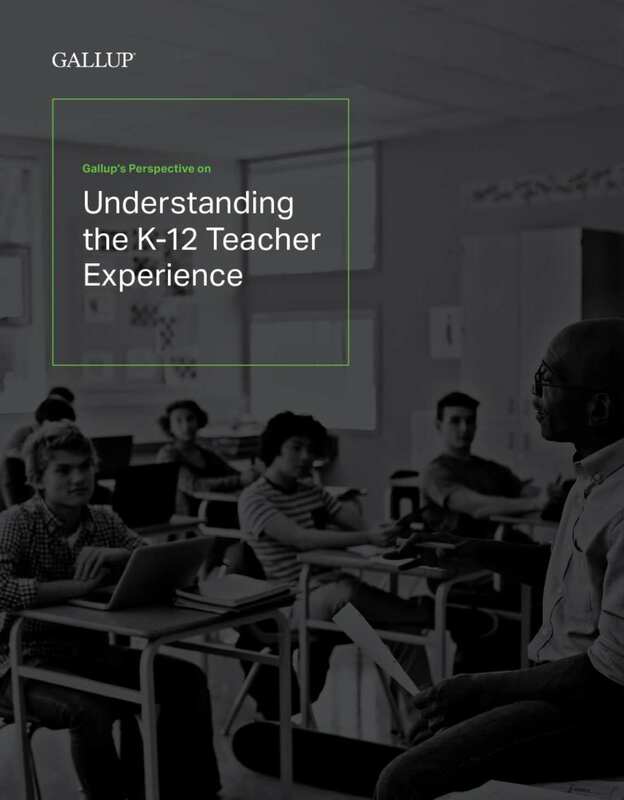 Understanding the K-12 Teacher Experience is designed to provide district leaders and principals a blueprint for crafting an exceptional teacher experience where teachers are more engaged, resulting in improved metrics on student engagement and performance. For decades, Gallup has worked with some of the largest U.S. school districts to bring our world-class research on the science of human potential to organizations like yours. By following the steps outlined in this paper, you can attract, develop and retain the greatest teachers. Create a teacher experience that empowers teachers to use their talents to drive higher student outcomes.